Troggu - thanoscardgamess jimdo page! Troggu, also known as Trogga or Tappa, is a form of Tarot played in the German speaking part of canton Wallis in Switzerland. Here the game is played by 3 players. One player (the Tappist) plays alone against all the rest, who form a temporary team. 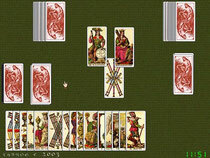 The Tappist is allowed to improve his hand using cards from the Tapp (talon). The players have to bid first. The options are to pass, to offer play a normal game or to play a Solo (play alone without using at the Tapp). At the end of the play, each side counts the card points in their tricks. The Tappist or Soloist also adds in the value of the cards in the Tapp. When speaking, if everyone passes a misere is played (the object being to avoid winning points). You play it with a French Tarot card deck.